In 2009 I gave myself a Christmas present (sidenote…I think everyone should do this) of a Baking Series class at the Cambridge School of Culinary Arts in Cambridge, MA. I didn’t have a blog then, and I didn’t know much about baking, but I knew I wanted to learn. And boy, did I! It was a wonderful experience, and I baked and ate many, many (many) things…but the recipe I enjoyed the most was this Sour Cream Citrus Pound Cake. Banish all thoughts of bottled extracts, and grab an orange, lime, and some lemons instead. 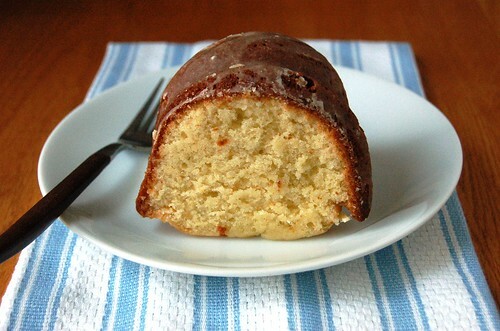 The tang of the citrus zest gives the cake such a wonderful aroma and flavor, and like all pound cakes, it also works well as a Bundt…arguably my favorite way to serve cake. Check your frosting at the door, ma’am. Mix up a simple glaze and drizzle that on instead, thank you very much! Look at that shining beauty! Don’t worry about wasting the glaze. Once you remove the wire rack you can run your finger down the baking sheet and pucker up. I thought this was a great cake to make for Easter, since this is the time of year when we New Englanders are at the point where we would seriously consider trading a kidney…or a firstborn…for a few warm breezes and the promise of summer. 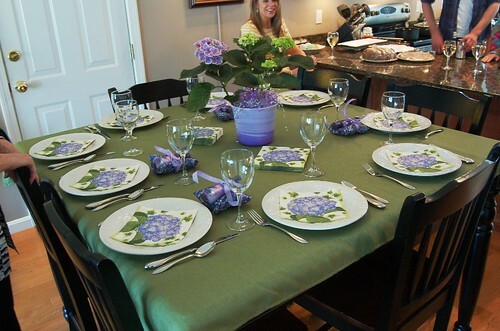 Speaking of Easter…how lovely was the hydrangea-themed Easter table at John’s parents’ house? I also never turn down a slice of this cake. 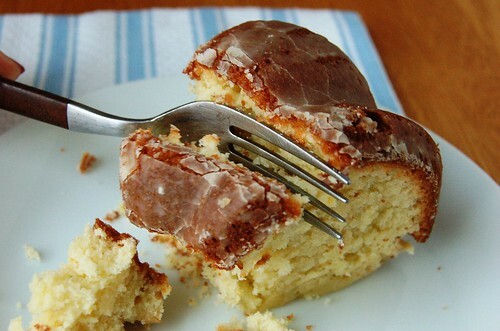 That donut-y crackly glaze is just heaven. I had a wonderful and delicious Easter. If you celebrate it, I hope you did, too! 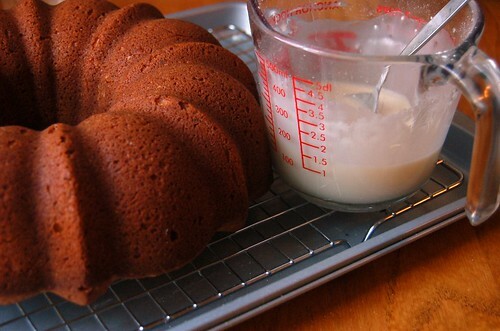 Preheat the oven to 350 degrees and grease/flour one 12-cup Bundt pan or two 9×5 loaf pans. Set aside. In a large bowl, cream butter and sugar until light and fluffy. Add eggs one at a time, stopping to scrape the side of the bowl as needed with a rubber spatula. In a small bowl, combine sour cream with vanilla and citrus zests. Add dry and wet ingredients alternately to butter and sugar mixture until just combined – do not overmix. Pour batter into Bundt pan or loaf pans and bake for 50-60 minutes or until a toothpick or skewer inserted into the center comes out clean. Allow cake/s to cool before inverting onto a wire rack to cool completely. 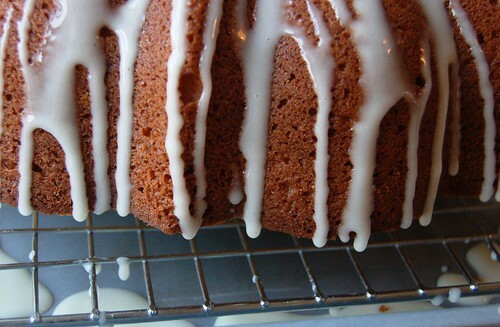 Drizzle glaze, allow glaze to harden, then enjoy! The Peep-tinis are adorable and that cake looks delicious! I am dying to do a baking series at CSCA… but I keep end up having to save money for other things. 😦 Hope you had a very happy Easter! Megan, every time I see I have a “first comment” I know it’s going to be you! How do you do it?! 🙂 I love a themed cocktail – it was such a fun way to celebrate! Glad you had a lovely Easter on the Cape!! I really, really need to censor some of my exclamation points. Yikes. I once took a vegan baking class at the Cambridge Center for Adult Education, and the instructor forgot to pack the sugar. Disaster ensued. Your experience at the CSCA sounds like an absolute delight. It looks like you all had a wonderful holiday. I will now think of excuses to make sugary drinks so I can sneak jelly beans at the bottom of the glass. Molly, I hope you had an amazing trip! CSCA did a great job – I’d take another class with them in a heartbeat! This cake is absolutely delicious! It’s wonderful for dessert or with morning coffee. (as we “speak”) Thanks for making it for us. Thanks also for the shout out about our Easter festivities. It was a terrific day to be together. 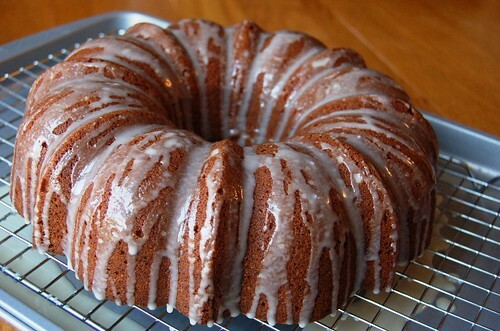 That pound cake looks AMAZING!!! 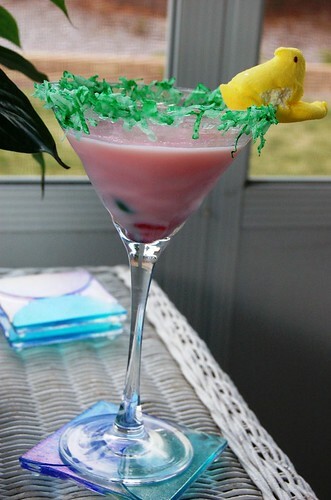 And I LOVE the Peep-tini’s! Such a creative idea!!! Yeah CSCA!! How did I not know that you took a class there? Sweet pics, dude. As always! Oh and btw, I always buy myself a birthday gift. Might be giving myself that series for the big 3-0.